BRUSSELS — On the last day of the Golden League season, American Sanya Richards, Yelena Isinbayeva and Kenenisa Bekele will compete for the $1 million jackpot at the Van Damme Memorial. The prize goes to those who win all six of the premier European meets. If more than one contender remains perfect by Friday night, the pot will be divided. 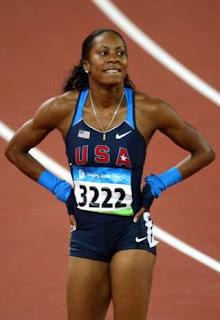 Two years ago, 400-meter runner Richards shared half the jackpot with pole vaulter Isinbayeva. Richards earned her first major individual title at the world championships last month in Berlin. She is poised to join Isinbayeva again, especially after she set the fastest time of the season at the Weltklasse last week. "I still feel fresh and in top shape," Richards said. The race for the jackpot will have to make up for a postponed showdown between Usain Bolt and Tyson Gay in the 100 meters. It would have been a rematch of the world championship final, where the Jamaican set a world record of 9.58 seconds and Gay finished second. But Bolt opted for the 200 instead, while Gay decided against joining his rival because running the curve would put too much pressure on his injured groin. Instead, Gay will face Asafa Powell in the 100. Bolt was never in line for the Golden League jackpot because he did not compete in all six meetings. At the end of a long summer, Bolt is no longer predicting magic every time he steps on the track. He only wants to beat the 19.79 record of King Baudouin Stadium set by Gay three years ago. That is way off the world record of 19.19 he set in Berlin at the worlds. "My body is a bit tired, but it should be good," Bolt said. It doesn't mean the capacity crowd of 50,000 will have to do without world records. The Van Damme will specialize in the esoteric marks on Friday, with Gelete Burka of Ethiopia going for the record in the rarely run 2,000 meters and a quartet of Kenyan men going for the even quirkier record in the 6,000 relay. Much will depend on the rain and wind, and both have been promised. Temperatures could stay as low as 64 degrees, tightening up muscles. Fickle winds are especially troublesome for the pole vaulters and it seems to be the only thing standing between Isinbayeva and at least a share of the golden jackpot. After her stunning no-jump exit at the world championships, the Russian bounced back last week with a world record of 5.06 meters at the Weltklasse, the penultimate of the Golden League meetings. It will be equally tough to bet against Bekele in the 5,000 after the Ethiopian dominated the whole season and added a long-distance double in Berlin. He felt sluggish during his win at the Weltklasse, and flew back to Ethiopia for four days of high-altitude training. Bekele won't worry too much about his time, because his eyes are on the golden jackpot. "The big issue is to win," Bekele said after arriving on a 7-hour flight from Ethiopia.